Space-Saving Solutions For The Kitchen! - Reither Construction, Inc.
Space-Saving Solutions For The Kitchen! The kitchen is the heart of the home. It’s arguably the most important room in the house, as well as its strongest selling point. The kitchen is the area where your family, friends, and guests gather to spend time together. Whether you are making breakfast for your loved ones or hosting a cocktail party, a spacious, comfortable kitchen is a great investment that you will cherish and appreciate daily. Don’t put up with a cramped and cluttered kitchen when you can easily create open space by incorporating the following ideas. Do you love sunlight and all things bright? Incorporating plenty of window space will flood the kitchen with natural light, amplifying and enlarging the space. Beautiful, large windows will also allow you to enjoy your view and scenery outside. If it’s still too dark, consider under-cabinet lights, which are handy for creating a cool ambiance and making the kitchen work space brighter. 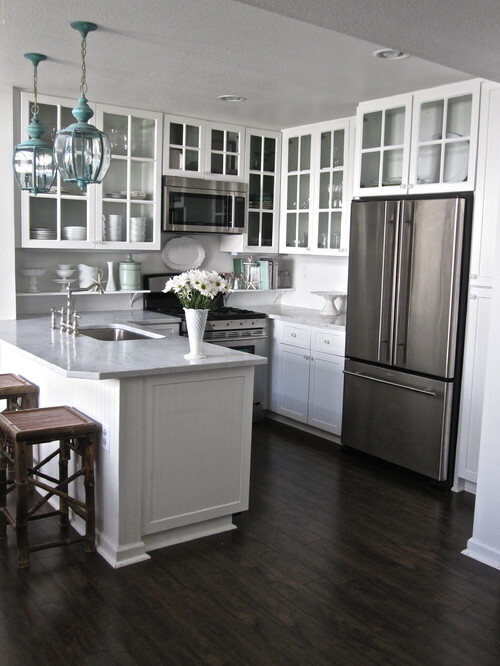 Incorporate glass cabinet doors in your kitchen. The glass tricks the eye into thinking the space is more expansive. Installing glass cabinetry will lighten and modernize the look while adding a sense of depth and openness in your kitchen. In addition, the glass allows you to display your beautiful cookware and show off your favorite kitchen items. Sleek stainless steel appliances and ceramic tile surfaces also help create space by reflecting light, which exaggerates the space. 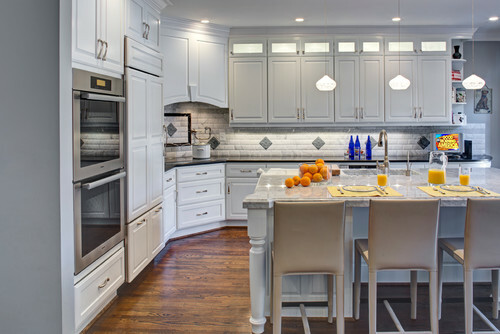 Clean lines and crisp, white colors will lessen the visual clutter and give your kitchen a spacious look. Do you love to cook and entertain? A center island is a versatile feature that can be used as a prep surface. Not only does an island provide a necessary work space, but it also serves as a seating and eating area. Stylish and simple stools provide seating that can be tucked away and avoid using valuable floor space. An island enhances the flow of the room and carves out storage space for those who always need more space in their kitchen. Additional drawers and cabinets on an island keep supplies more easily accessible. By implementing any of these easy options, you and your family are sure to enjoy the benefits of a spacious kitchen.